Editor’s note: The review-essay of Paul Mattick’s book Marx and Keynes, excerpted here, first appeared in the January 1970 News & Letters. Today’s revival of interest in Marx, especially since the onset of the 2008 economic meltdown, includes a significant strain of economism and has revived controversies and issues addressed by Dunayevskaya then. This [*] is a most disappointing book. Or perhaps the more correct description would be: a most revealing book. In part, this is due to its sheer length (364 pages), which allows the author (Paul Mattick) to make explicit what, heretofore, as essayist, he left only implicit. But the more fundamental reason for the revelatory character of the book is thetiming. Ever since the Hungarian Revolution moved the Humanism of Marxism front-center of the historic stage, it has become impossible for economism to hide its underlying anti-Marxism. Should this description of a Marxian economist sound defamatory, the reader must listen to Mattick himself. The revelation of his rejection of Marx’s Humanism is his, not mine. It is he, not I, who is appalled at “the recent vogue of the socialist humanism of the young Marx, who considers the alienation of labor in capitalism a result of the ‘alienation of man from his true nature.’ This unMarxian Marx well fits the welfare state and can even be used in the ideological war against the ideological Marxism of the state-capitalist adversary” (p. 282, emphasis added). How like the state-capitalist ideologists calling themselves Communists–as well as today’s Trotskyists–Paul Mattick sounds! His rewriting of history, no doubt, has different motivations than either those holding state-capitalist power, or hungering to do so. But this does not turn untruths into truths. 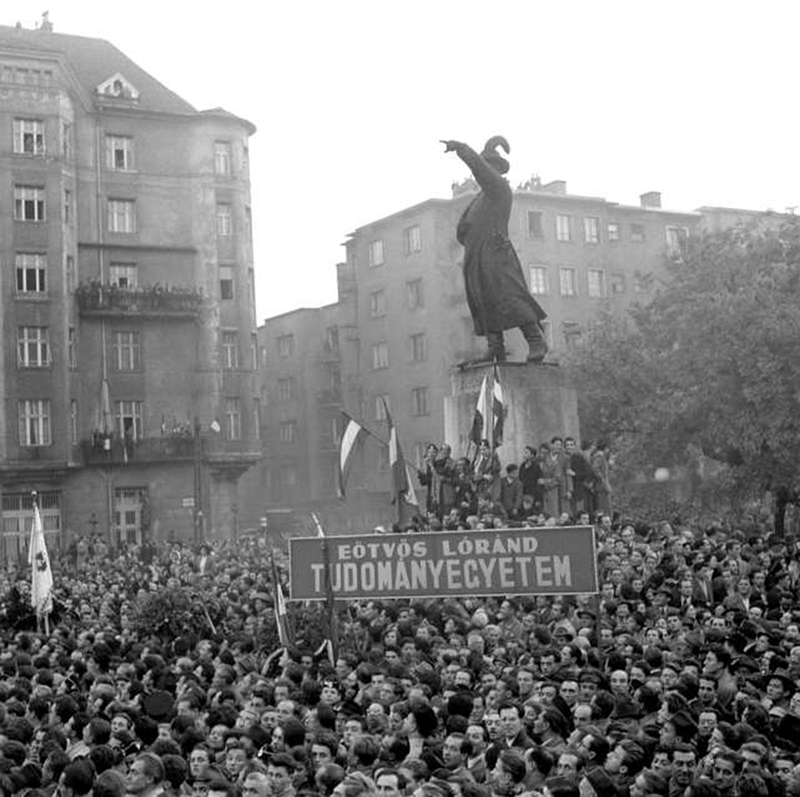 The Oct. 23, 1956, rally in Budapest at the statue of General Bem, a Pole who fought with the Hungarians in the 1848 revolution, expressed Hungarians’ solidarity with the striking Polish workers. This rally touched off the Hungarian Revolution. It was not the “welfare state,” but the Hungarian Freedom Fighters, the proletarian revolutionaries, who brought Marx’s Humanism from the musty bookshelves onto the world historic stage. It is not “the recent” welfare state ideologist’s “use” of the “unMarxian Marx” that has produced the “vogue,” but the ceaseless East European revolts, from East Berlin, 1953, to Czechoslovakia, 1968, that keeps Marx’s Humanism alive. The “young Marx’s” philosophy of liberation became, also, the underlying philosophy of the African Revolutions against Western Imperialism. Nor did Marx’s Humanism, in circling the globe, come to a standstill as it reached the so-called welfare states. On the contrary. In reaching the world citadel of the “welfare states,” the U.S., the theory of alienation of the “unMarxian Marx,” far from “fitting” the welfare state, gave birth to a new generation of revolutionaries, Black and white, who sought and are seeking to uproot it. Indeed, to come from the sublime to the petty, even the aloof and mature Paul Mattick has been compelled to acknowledge the history-making long life of the now famous 1844 Economic-Philosophic Manuscripts, albeit in a slanderous form. No doubt the “mature” Marxist economist had known of these long before now (1969, the year of publication of his Marx and Keynes). No doubt he knew about them long before the very first East European uprising of the East German workers who dared challenge both Russian Imperialism and their own state-capitalist overlords of the productive process. Simultaneously with that movement from below in the birthplace of Marx, a few brave intellectuals also confronted the Communist ideologists with Marx’s Humanism. This dualmovement, from practice and from theory, however, had no more effect on Mattick’s economist interpretation of Marx than the very first discovery of Marx’s Humanist Essays in the late 1920s by the great Marxist scholar, Ryazanov. It needed a social revolution as great as October 1917, before it became possible to pry this unpublished heritage of Marx from the vaults of the Second International where they had lain buried since the death of Engels. In a word, at no time from their first discovery, through the period they made history anew in live class battles, until today, did the authentic voice of Marx– of Marx, not Lenin, of Marx’s philosophy of liberation, not of Lenin’s theory of the “vanguard party”–cause Mattick to question his economist interpretation of Marx. On the contrary, instead of facing the reality of his failure to fully comprehend the philosophy of Marx, he stoops to Stalinist-type amalgam-building. The “vogue” of Marx’s Humanism, he now dares claim, “fits” the welfare state! Paul Mattick’s presumptuousness in declaring the authentic voice of “the young Marx” to be that of some “unMarxian Marx” has one salutary effect….Now the reader…feels compelled to return to the beginning of the formless book to see what is Mattick’s comprehension of Marxism. The first chapter where Paul Mattick deals directly with Marx on Marx’s own, not Keynes’, foundations is Chapter 3, “Marx’s Labor Theory of Value.” This, and the chapters on “Accumulation and the Falling Rate of Profit” as well as the two chapters on “The Realization of Surplus Value,” and “Capitalism in Crises” are the best in the book. Mattick has always written seriously when criticizing Marxists who departed from the “materialism” of Marx. On that point he is even capable of escaping his own narrow economism. Thus, in taking other Marxian economists to task, he writes: “When Marx speaks of the ‘law of value’ as relating to a deeper reality which underlies the capitalist economy, he refers to the ‘life process of society based on the material process of production'” (p. 29). Thus, also, he criticises George Lichtheim for identifying the Ricardian and Marxian law of value while heaping empty praise upon Marx as “the last, as well as the greatest of the classical economists.” Mattick comments: “Even though Marx accepted and developed Ricardo’s value theory, he was not the ‘greatest’ of the classical economists, but their adversary” (p. 28). Here he himself draws a sharp distinction between narrow economism and Marx’s concept of the “life process of society based on the material process of production.” Nor does Mattick limit his criticism to reformists, but extends it to revolutionary Marxists. Thus, he hits out against Hilferding for reducing Marx’s materialist conception of history to the value theory: “…the materialist conception of history is not identical with the labor theory of value. It discusses social development in general, of which capitalism is only a special case” (p. 34). Nor, Mattick continues, is it “merely a question of conscious as against unconscious regulation” (p. 35). The law of value, and, inseparably from it, the law of surplus value, applies to capitalist societies and only to them…. So foreign, to Mattick, is the integrality of Marx’s philosophy of history with his economic categories that he makes a total hash out of Marx’s original economic categories. Mattick forces into identity Marx’s split of classical political economy’s category of labor into abstract and concrete labor, and the further singling out from labor, as activity, its commodity-form of appearance, labor-power. Where Marx speaks of the twofold character of labor, Mattick “restates” it as “the twofold character of labor-power” (p. 57). The obtuseness of Mattick to Marx’s philosophic analysis of the all-pervading fetishism of commodity-form, literally calls for him to make such false identification as if it were, indeed, the commodity rather than the activity which “produces” value and surplus value. The twofold character of the commodity–use-value and exchange-value–is of course only the phenomenal expression, the cover-up of the exploitative relationship at the point of production, all of which Mattick “knows” very well. Then why attempt, with a single stroke of the pen, to do away with the fetishism of commodities by identifying Marx’s analysis of labor, as activity, with labor-power as commodity? Had the mature Mattick followed Marx into the labor process itself, he could not have mixed up “economic categories” and could not have escaped seeing the labor-capital relationship as not only an exploitative one, but also a perverted one. Throughout the four volumes of Capital, the most mature Marx pounds away at this capitalistic perversion–the reification of labor, the transformation of man into a thing and the revolt of the workers against this. Evidently, for the knowledgable Paul Mattick, the commodity-form holds no secrets; labor and labor-power may appear synonymous to one who doesn’t feel the full weight of the capitalistic perversion of subject to object, of man into mere appendage to machine, of the transformation of concrete labor into the abstraction, value. But Marx, after laboring more than a decade with the exposition of the fetishism of the commodity-form which, on the surface, appeared so simple that all “took it for granted,” was still dissatisfied even after the first edition of Capital was published in 1867. Without full comprehension of this philosophy, Mattick ends, not only by separating what Marx had united–philosophy and economics–but, inescapably, isolates himself from the voices from below in his era and thus falls prey to Keynes…. The result is that his only “original” category for world economic development of our era is “mixed economy.” Even the concept of state-capitalism becomes subordinated to the “theory” of the mixed economy. No wonder he falls such easy prey to the Keynesian “revolution” in economics that he reverses history itself to make it fit the economic theories of Keynes. “Though carried out in the name of Marx,” writes Mattick (in referring both to the 1917 Revolution and to the imperialist adventures of present-day Russian Communism, as well as the African Revolutions [**] which broke out spontaneously, totally unconnected with Communism), “the state capitalist or state socialist revolutions would be better described as ‘Keynesian revolutions'” (p. 279). We have no time to waste on exposing such a fantastic turning upside down of actual social revolutions which produced phenomenal changes in bourgeois economics, not to mention Mattick’s retiming of history so that Keynesian economics, which was not born until the 1930s, nevertheless “fits” 1917. What is of importance is that this has led him to bring into the open, his anti-proletarian “philosophy,” which both objectively and subjectively, does indeed fit in with state-capitalism and “welfare state” ideologists as well as with all who have departed from Marxism. Like all of them, Mattick abuses Marx’s vision of the revolutionary nature of the proletariat–“The proletariat is revolutionary or it is nothing”–in order to shout loud his hostility to the proletariat: “At present it (the proletariat) is nothing…” (p. 337). * Marx and Keynes, The Limits of the Mixed Economy, by Paul Mattick (Extending Horizons Books, Boston, Mass., 1969). ** For a discussion of the African Revolutions, see my Nationalism, Communism, Marxist Humanism and The Afro-Asian Revolutions. For an on-the-spot report directly from Africa, see my Political Letters, Nos. 34 thru 39. Both are available through News and Letters Committees. This entry was posted in Marxist-Humanism and tagged 1844 Economic-Philosophical Manuscripts of Karl Marx, alienated labor, East German Revolt of 1953, Humanism, Hungarian Revolution of 1956, John Maynard Keynes, Karl Marx, labor power, Labor Theory of Value, Marxian economics, Marxism, Paul Mattick, philosophy, Prague Spring, V.I. Lenin, workers. Bookmark the permalink.